Lots of folks blogged up 2010 Upper Deck's weird handling of MLB logos, which they (supposedly) aren't licensed to display. They do leave off team names, but any avoidance of logos is "casual" at best. As a well-heeled company focused on the card market, UD might set precedent where past oddball makers didn't see a battle worth fighting. A quick sift through the type collection turned up this ready example. With the same players-only license, Sunoco wiped out hat logos and used cities instead of team names. The Orioles become "Baltimore" on the front and "Outstanding O's" on the back. Sunoco's set honored 12 combos and doubled up on 2 classic teams, Boston and New York. Links go to any card scans I located. 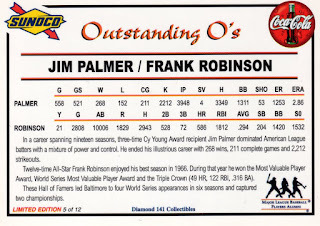 Palmer and Robinson rank among the best O's ever, but are they #1 and 2? 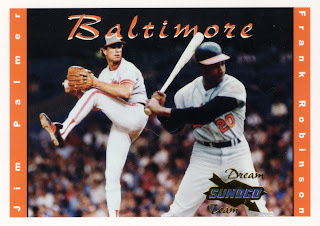 Check out Frost King Baseball's "All-Time Best Orioles (Since 1955)" for a stat-friendly answer.